The following tips explain how to design an outstanding leaflet to effectively market your business. Leaflet is an effective approach to help your business enter market. Essential leaflet design can help you influence potential and existing customers. Here are some tips for making outstanding leaflets. 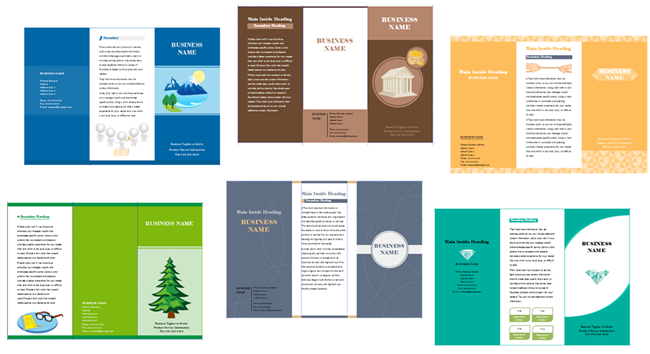 Before you start the leaflet design, the first thing is to identify who are your target customers. Who will buy your product/service? Make sure everything you create will be appeal to them. For example, if your potential customers are young ladies, the color of your leaflet should be girly. Headline is very important for a leaflet. It will determine whether your audience will continue reading or not. You need to spend time and effort to make your headline appealing. Usually he headline will contain the key messages of your business. You can also use attractive words to draw people's attention and let them see the inside words. And don't forget to use big fonts to make it visually striking. Keep your content concise and avoid listing too much detail on your leaflet. Remove unnecessary and boring information. Use short sentences and break up big text blocks by using small paragraphs. Make sure it's easy for them to find the key information. To make the leaflet eye-catching, images and graphics are indispensable. As we know, images are more straightforward than words. Using appropriate pictures will grab the audience's attentions at the first glance. Remember that your image should be of high resolution and visually pleasing. Before you printing, make sure there no spelling mistakes and all expressions are easy to understand. The proofread job always requires more than one person. Ask others to check over the leaflet thoroughly and make it perfect. You leaflet is not only used to create awareness of your product, but also make potential customers take further step to know your business. Therefore, it's important to call them to act. You could offer some special discounts that are only valid before a special date, or give a free gift for anyone having the leaflet, etc. 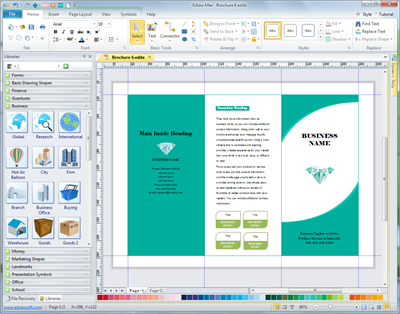 Edraw offers standard A4 size 3-fold leaflet templates that you can directly edit on. A ready made template will save you a lot of trivial work to do. Use need to use Edraw to open and edit these templates. To easily layout the leaflet, you can use Edraw. It's a drag-and-drop based leaflet maker, easy to use and rich in feature. You can freely add text blocks and images, place them to any place, and resize easily. With the dynamic smart guides and gridlines, the layout could be very accurate. What's more, it contains vector drawing tools, through which you can draw any vector graphics and apply to your leaflets.